This paper presents Anchor Ball, a thrown device with a tether for use safely and quickly in search and rescue operations in dangerous situations. To enable the Anchor Ball to stick to various types of walls, the principle of suction inspired by octopus suckers is introduced, which is composed of a multiple-holed surface for indirect suction and an adhesive elastic film for the seal. A shape-adaptive structure with adjustable stiffness is also introduced to help the Anchor Ball stick even on rugged surfaces. 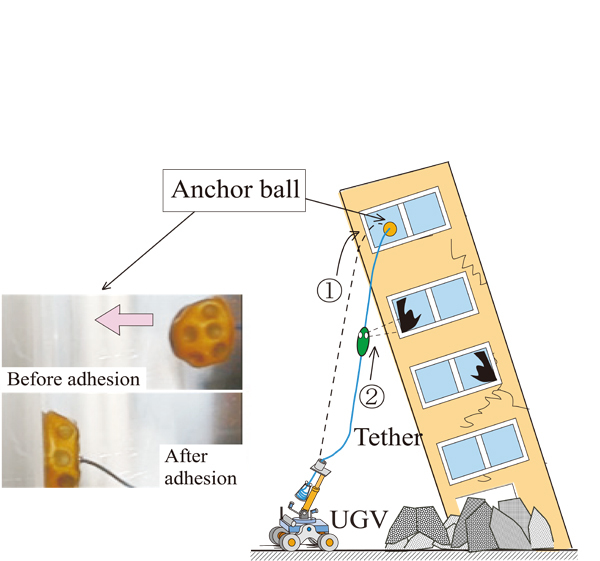 After the characterization of the Anchor Ball is described, the effectiveness of the proposed methods is verified by demonstrating inspection inside a building by combining with Fluid Powered Ropeway which enables to carry the exploration apparatus along with the flexible tube, which is shown in videos at the website [a]. H. Tsukagoshi, K. Fuchigami, E. Watari, and <. Kitagawa, “Deformable Anchor Ball for Thrown Referring to Octopus Suckers,” J. Robot. Mechatron., Vol.26, No.4, pp. 477-485, 2014. N. Asano and S. Hirose, “Development of Casting Hook with Teleoperated Releasing Function – Consideration of Electric and Pneumatic Tele-driving Mechanism –,” Proc. of the 2007 JSME Conf. on Robotics and Mechatronics, 2A1-J06, 2007 (in Japanese). H. Arisumi, K. Yokoi, and K. Komoriya, “Casting manipulation – Midair control of a gripper by impulsive force,” IEEE Trans. Robot., Vol.24, No.2, pp. 402-415, 2008. K. Fuchigami, E. Watari, H. Tsukagoshi, and A. Kitagawa, “Development of Casting-Type Adhesive Object to Aid Rescue Operations inside Dangerous Buildings,” Proc. of Robotics and Mechatronics Conf., 2A1-J11, 2011 (in Japanese). P. E. Rybski, I. Burt, T. Dahkin et. al., “System Architecture for Versatile Autonomos and Teleoperated Control of Multiple Miniature Robot,” Proc. of the 2001 IEEE Int. Conf. on Robotics & Automation, 2001. S. Kim, M. Spenko, S. Trujillo, B. Heyneman, D. Santos, and M. R. Cutkosky, “Smooth Vertical Surface Climbing With Directional Adhesion,” IEEE Trans. on Robotics, Vol.24, No.1, pp. 65-74, 2008. H. Prahlad, R. Pelrine, S. Stanford, J. Marlow, and R. Kornbluh, “Electroadhesive robots – wall climbing robots enabled by a novel, robust, and electrically controllable adhesion technology,” IEEE Int. Conf. on Robotics and Automation 2008, pp. 3028-3033, 2008. M. Kovac, J. Germann, C. Hürzeler, R.Y. Siegwart, and D. Floreano, “A perching mechanism for micro aerial vehicles,” J. of Micro-Nano Mech., Vol.5, pp. 77-91, 2009. G. D. Wile, K. A. Daltorio, E. D. Diller, L. R. Palmer, S. N. Gorb, R. E. Ritzmann, and R. D. Quinn, “Screenbot: walking inverted using distributed inward gripping,” IEEE Int. Conf. on Robotics and automation, pp. 1513-1518, 2008. W. Shen, J. Gu, and Y. Shen, “Permanent magnetic system design for the wall-climbing robot,” Applied Bionics and Biomechanics, Vol.3, No.3, pp. 151-159, 2006. G. La Rosa, M. Messina, G. Muscato, and R. Sinatra, “A lowcost lightweight climbing robot for the inspection of vertical surfaces,” Mechatronics, Vol.12, No.1, pp. 71-96, 2002. K. A. Daltorio, A. D. Horchler, S. N. Gorb, R. E. Ritzmann, and R. D. Quinn, “A small wall-walking robot with compliant, adhesive feet,” IEEE/RSJ Int. Conf. on intelligent robots and systems, pp. 3648-3653, 2005. F. W. Grasso, “Sensational Sucker,” Scientific American, October 2010. “Throwing-type adsorption ball,” Japanese patent application, No.2011-113877. A. Nagakubo and S. Hirose, “Wall Gait: A Standard Gait for the Quadruped Wall-climbing Robot,” Proc. of Int. Conf. on Advanced Robotics, pp. 547-552, 1993. K. Kuwahara, H. Tsukagoshi, and A. Kitagawa, “A soft finger with the function of attaching and holding internal organs referring to an octopus sucker,” Proc. of Robotics and Mechatronics Conf., 1A1-B14, 2013 (in Japanese). 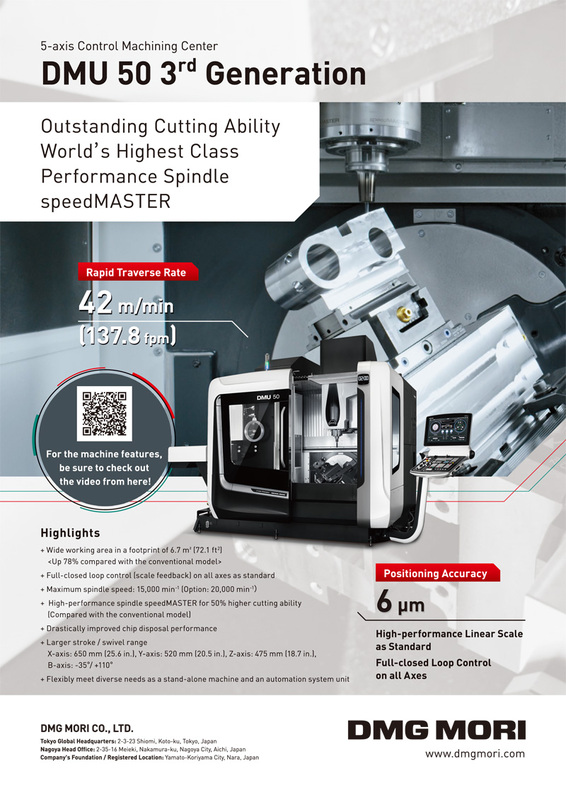 S. Kikuchi, T. Takahashi, M. Suzuki, and S. Aoyagi, “Development of flexible vacuum gripper using suction cups for absorbing freeform object,” Proc. of Robotics and Mechatronics Conf., 1A1-K03, 2013 (in Japanese). H. Tsukagoshi, H. Chiba, and A. Kitagawa, “Gel-type Sticky Mobile Inspector to Traverse on the Rugged Wall and Ceiling,” IEEE Int. Conf. on Robotics and Automation, FrA2.5, 2009. E. Watari, H. Tsukagoshi, A. Kitagawa, and T. Tanaka, “Design of a Casting Device for a Tethered Payload Aiming Higher Access for Mobile Robots,” IEEE/ASME Trans. on Mechatronics, Vol.3, Issue 4, 041002-1/041002-11, 2011. E. Watari, H. Tsukagoshi, and A. Kitagawa, “Methods for a Higher Casting of a Tethered Child Machine Using Pneumatic Cylinder,” J. of the Japan Fluid Power System Society, Vol.43, No.6, pp. 149-156, 2012. H. Tsukagoshi, Y. Mori, and A. Kitagawa, “Fast Accessible Rescue Device by Using a Flexible Actuator,” Int. Conf. on Robotics and Automation, pp. 1175-1180, 2012. Y. Mori, H. Tsukagoshi, and A. Kitagawa, “Fluid Powered Actuator Sliding Along Flexible Flat Tube (1st Report: Proposal of Λ-drive and Its Driving Analysis),” J. of the Japan Fluid Power System Society, Vol.41, No.5, pp. 98-105, 2010.